SEPPA has conceptualized the most Innovative methods for the growing demand of efficient bottle water packaging and complete line solutions. SEPPA's focus is on sustainable production of the RFC and consistency to create solutions for enhancing productivity, hygiene and line speed. 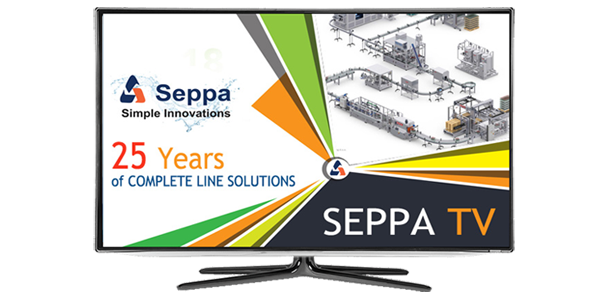 SEPPA designs are driven towards maximum uptime and reduced cost of production. Due to the neck handling system SEPPA's RFC's Ability to handle different shapes and lower grammage of bottle is the most important feature for creating line Flexibility. 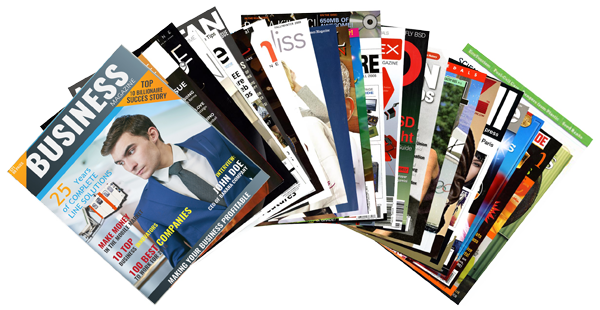 This helps in launching new products designs and packaging types in the same line. 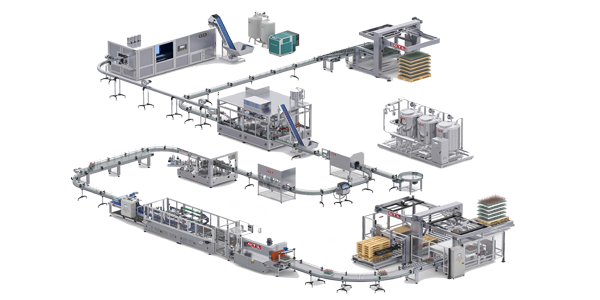 The SEPPA EVATS - 1000 - RFC is the most advanced RFC for Small, medium and large scale bottling lines. Various products from water, Juice, Yoghurt, Milk, Beverage, alcohol, wine, sports drink and ice tea can be packaged in this RFC. Apart from this carbonated beverages as well as beer can be packaged in it. The RFC has variants which can handle hot fill (ie) products at 400C to 800C as well as cold fill (ie) products at 20C to 70C. Thus the RFC has flexibility in filling products of 00C to 800C. Central tank, with product feeding form the bottom of the rotating manifold. Entirely stainless steel (grade 304/316 /316L) draining base. Reliable, simple and easily sanitized valve. "No bottle no fill",, no electronics in the machine. PET bottle transfer - neck-handling - with no need for monoblock height adjustment. Possibility of installing a level control system. TRI BLOCK configuration available, for an integrated rinsing- filling-capping solution. Controlled contamination cabin, micro isolator and cap sterilizing unit available in option in order to enhance hygienic standards. An external tank for recovery of the recycled product and pumping back to the pasteurizer. Universal product deflection without deflector (swirl device). No dynamic gaskets in contact with the product: the shutter is sealed by a simple membrane, protecting the movement form contamination. Evacuation to the outside of air returning from the bottles to prevent possible contamination. Automatically engaged dummy bottles as option.. Valves made entirely of AISI 316 stainless steel. Quick changeover for packages with different diameters. Possibility of managing pulp up to 3 mm in diameter and 10 mm in length. Extremely fast, simple and reliable mechanical valve, featuring "no bottle no fill" without any electronic. In the HR variant the valve allows filling with products containing large pieces of pulp and fibre. Possibility of filling “to brim”. The filling process has been designed to maintain the temperature of the whole circuit (valves, tanks, pipes) even in the event of long stops by means of product recirculation both in valve and in bottle. No dynamic gaskets in contact with the product. Small number of static gaskets. No wells or dead areas inside in order to prevent possible stagnation of product and increase efficiency of washing cycles. The fixed valve with bottle lifting jack allows the use of the microbiologic isolator (ISO 7) to protect the filling valve area. Sanitation cycle with the use of dummy bottles. Fitting and removal of these takes place in an extremely simple and functional way by means of a special bayonet connection to avoid direct contact between operator and valve, as an option, it is now available the automatic engagement of the dummy bottles. Circuit preset for high temperature CIP. The filler is designed for filling PET bottles, but can also be configured to handle glass bottles. Valve with magnetic flow meter for definition of the content in the bottle. Designed for filling large formats (from 3 to 5 litres). During filling, the bottle is kept in position by a mechanical gripper. Simple to operate with selection of the various formats directly from the operator panel. Simplified access for maintenance of the motor and the manifold l.
The sanitation phase is very simple and is managed fully automatically through a control on the communication keyboard: the cycle is carried out in such a way that the solution laps against all the internal areas of the filler with forced flows. Thanks to the configuration of the filling valve, the filler features an automatic engagement/disengagement system with extremely simple and functional electro-pneumatic control, which ensures there is no contact between operator and machine.. Circuit preset for CIP and SIP up to 100 °C. No contact between valve and bottle. High flow performance and filling speed modulation to optimize the large size filling process. Extremely clean and simple filling valve. Modular range of electronic, volumetric filling monoblocs A new, extremely innovative and flexible platform, which takes the standard SEPPA technologies to the highest level currently available on the market. 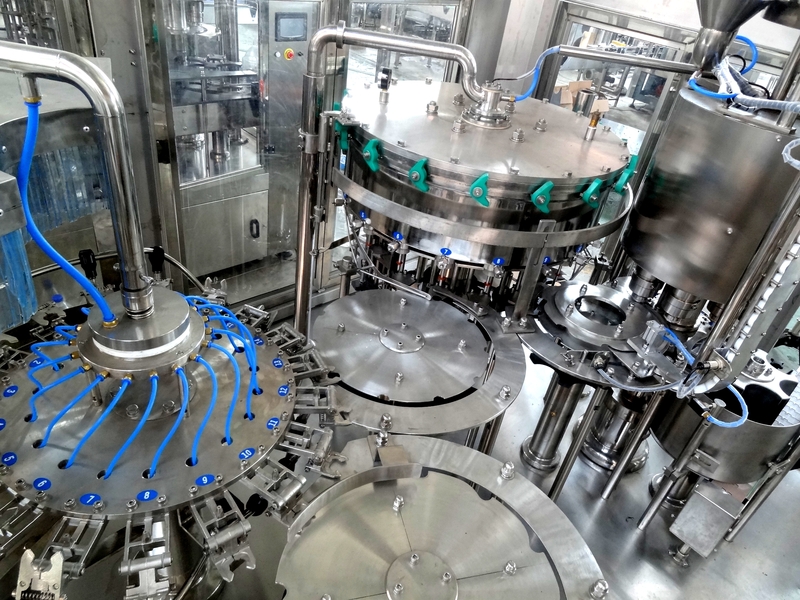 By taking advantage of the modular nature of all the elements of the platform, and choosing the most suitable filling valve, it is possible to create bespoke solutions for a wide range of bottling needs. In particular, the possibility of being able to fill several products on the same production line was one of our main aims when designing the ACCUFILTRONICS platform. External or central tank (in case of pulpy products). Valve with magnetic flow meter for product dosing in each bottle. Entirely stainless steel (grade 304) draining base. Simple to operate and great flexibility with selection of the various products/formats directly from the operator panel. PET bottle transfer - neck-handling - with no need for mono-block height adjustment. Sincro Bloc configuration available, for an integrated blowing- filling-capping solution. Controlled contamination cabin and cap sterilizing unit available in option in order to enhance hygienic standards. Extremely clean valves are ideal for the configuration of mono-bloc for cold filling of sensitive products without preservatives in Ultra Clean conditions. All the configurations can be produced with microbiological isolators, thereby minimizing the filling environment around the container. Product deflection without deflector (swirl device) for version with contact between bottle and valve. Accurate volumetric dosing (no change-over). Filling speed adjustment to handle foaming products. Bottle snifting into a separate collector. The air in the bottle does not come into contact with the product feeding circuit. All parts in contact with the product are made of AISI 316L stainless steel (opt.). Quick changeover for bottles and necks with different diameters. Latest generation of electronic/pneumatic components, managed by an industrial PC. from 1.000 to 60,000 b/hour based on 190 ML TO 2 litres with water (ambient temp.). Is an electronic volumetric gravity filler for PET bottles, equipped with “no contact”, double speed, shuttered filling valves. Designed for HF applications in Ultra Clean configurations. The valve-cleaning characteristics and the configuration of the mono-block make it particularly suitable for hot and cold filling of sensitive products such as premium fruit juices with pulps (non-homogenized). The configuration for the valve makes it suitable for products with pulps and fibres, even with big dimension ones. 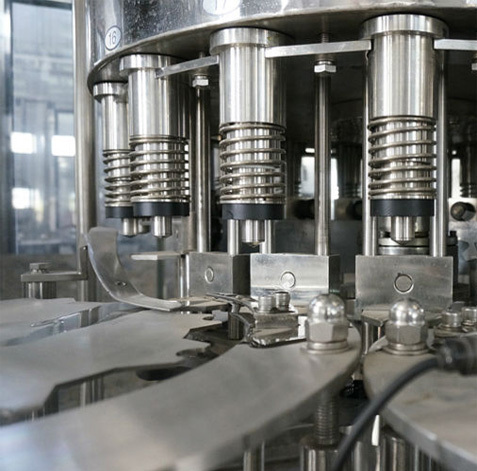 Is an electronic volumetric isobaric filler for bottling carbonated and non-carbonated beverages in PET bottles This is the most comprehensive configuration, equipped with an extremely flexible “multiproduct” contact valve: the same production line can deal with still, carbonated and hot fill products. The filling speed can be adjusted according to the product being processed. The configuration of the valve makes it suitable for processing products containing pulp and fibre, also with big dimension pulps. It is a weight filler with a very simple, clean and fast filling valve with no contact between valve and bottle. It is a 3 positions diaphragm valve with double filling speed. This solution guarantee high flow performances combined with an extremely accurate and precise product dosing. Product dosing by means of a load cell. 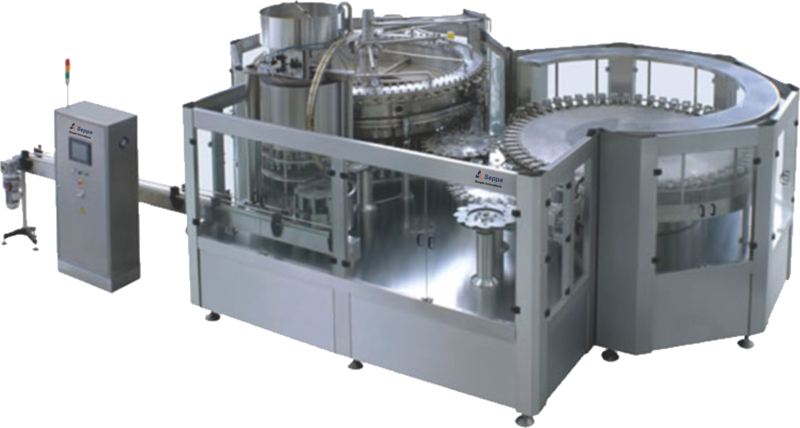 Weight filling technology is the most reliable and precise system for filling bottles with high-value products such as edible oil, milk, premium clear juices, home and personal care products. from 6000 to 36000 bottles/hour on 1.5 litres with edible oil. Is an electronic, volumetric gravity filler for PET bottles, equipped with a shuttered filling valve with contact between the valve and the bottle, and double speed filling: this is an extremely versatile valve for hot and cold filling of both smooth and pulpy beverages (also with big dimension pulps). This solution guarantees an optimization of the filling cycle and of the "brimful" filling. from 10.000 to 42,000 b/hour based on 1,5 litres with fruit juice (85 °C.). The sanitation phase is very simple and is fully automatic and controlled by the filler supervision: the machine prepares itself for the electro-pneumatic control of all the on-off valves. The sanitation cycle is carried out in such a way that all the product path is completely cleaned both in equicurrent and countercurrent. Automatic dummy bottles. Thanks to the configuration of the filling valve, the filler features an automatic engagement/disengagement system with extremely simple and functional electro-pneumatic control, which ensures there is no contact between operator and machine. Circuit preset for CIP and SIP up to 100°. Fillers in the ISOBARIC ACCUFILTRONICS-VM -CP-HF -C range, for carbonated products, are designed to be configured in SF fill version: this means that the carbonating or mixing unit tank will be used as a buffer tank for the filler, which no longer has the product tank on board. A pump sends the product to a ring-shaped manifold in order to ensure that the product is fed into the filling valve correctly. The integration of the mixing and filling units produces a final product that is of higher quality and more stable, resulting in an improved filling process. Great flexibility: multi product valves allow to handle on the same line still and carbonated, and hot filled products with or without pulps. High precision of bottled product. Optimized solutions to handle latest generation of ultra-light bottles. Valves made entirely of AISI 304, 316 stainless steel. 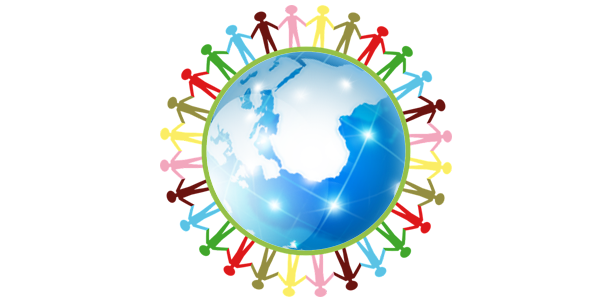 Filling technology suitable for sensitive products (i.e. CSD without preservatives at 2 to 18°C). The main products that can be processed are: carbonated soft drinks (with or without pulps), Carbonated mineral water, non-carbonated mineral water, clear and pulpy juices (also with big dimension pulps), isotonic and sport drink, Sensitive products (fresh or micro-filtered ESL milk, drinking yoghurt etc. ), beer, alcoholic beverages, edible oil, home and personal care products. Mechanical level filler for carbonated products in PET bottles was designed adopting advanced technologies. It has an innovative design and is equipped with special features for both filling and moving the bottles, which guarantee great advantages in terms of performance and operating flexibility. The valve is also able to fill non-carbonated products. Valve with height adjustable moving filling tube to define the level in the bottle. Product deflection without deflector (swirling device). A single filling tube for all the bottle sizes. Manifolded decompression carried out with the filling tube raised. Quick changeover for packages with different neck and bottle diameters. A mechanical level valve with extremely reliable and sturdy moving filling tube, which requires very little maintenance. It consists of a limited number of components and has been designed for a complete sanification, to avoid every possible area of product stagnation. The valve is extremely versatile and allows different containers to be handled without format change parts. The only adjustment is the re-positioning of the filling tube that takes place simultaneously for all the valves with a centralized control. The valve is complete with decompression button and centralized circuit for discharge of the snift. This operation takes place with the filling tube lifted and allows initial pressurization of the bottle and final de-pressurization to be carried out in clean filling tube conditions, so avoiding possible turbulence caused by nebulized product put into the bottle. Available in option a second circuit for bottle fluxing and pre-evacuation. The sanitation phase is very simple and is fully automatic, by means of a control on the operator panel: the machine prepares itself for the electro-pneumatic control of all the on-off valves. The sanitation cycle is carried out in such a way that the solution laps against all the internal areas of the filler with forced flows. Automatic dummy bottles: Thanks to the moving filling tube that characterizes the filling valve, it was possible to make an engagement/disengagement system with extremely simple and functional electro-pneumatic control that ensures there is no contact between operator and machine. Foam reduction solutions allow excellent filling performances even at ambient temperature. The main products that can be processed are: carbonated mineral water and CSDs, still mineral water, clear cold filled juices, cold filled isotonic and sport drinks, beer.